Learn about some of the bold and brilliant ideas researchers and conservationists have to rescue corals and coral reefs from disaster. NARRATION: Corals are in trouble. We are in a critical situation with our reefs, and if we fail to act, if we get paralyzed by the enormity of the problem, the majority of the world's reefs will be gone by 2050. But scientists and conservation programs are not standing idle. The NOAA Coral Reef Conservation Program is helping to monitor these important ecosystems to see how much damage is going on. But we’re also going in and trying to help reduce the stresses to the coral reefs in these areas. Some places have done things like, say that an area is so damaged right now that we don’t want divers in that area. We work with communities to make sure that land based sources of pollution don't get out onto reefs, and we work a lot with the fisheries folks to make sure that their fisheries that are on their reefs are sustainable. We’re working with scientists from many academic institutions to grow more corals in coral nurseries so that we can plant those corals out on the reef to accelerate recovery of those corals. 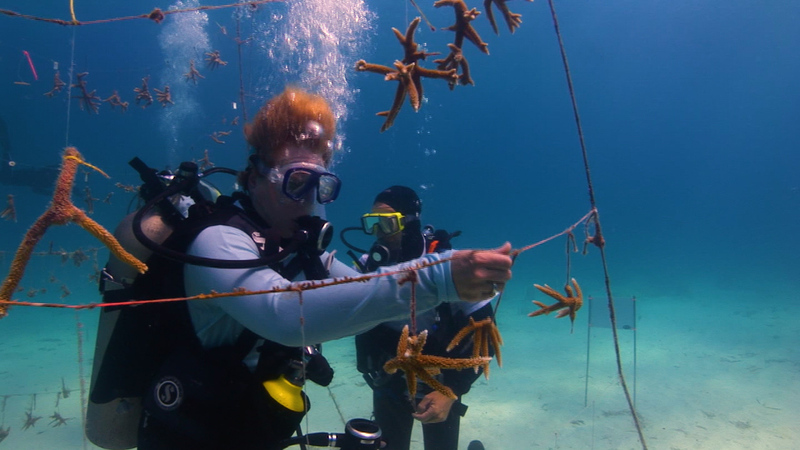 Over the last decade, the Coral Reef Conservation Program has transplanted tens of thousands of coral fragments to reefs in the Atlantic and Caribbean, and many other programs are doing the same all over the world. Dr. Ruth Gates, Director of the Hawaii Institute of Marine Biology, is one scientist making strides in selecting corals they think can better deal with bleaching. When we look at how corals bleach, we see individuals in the same species sitting side-by-side on the reef, one of which remains dark brown through the event that’s causing the one right next door to go white and die. We see different species that are responding differently. We see whole reefs that are doing better than other reefs. And the question is why. We know there are three things that dictate the outcome of a stress event: Who they partner with -- are they with the right type of microalgae? Who their parents were -- their base genetics; and, what their environmental history has been. If they’ve survived a bleaching event in the past, they’re more likely to survive a new event. Through the last two bleaching events in Hawaii, we were able to go out and mark hundreds of coral colonies on the reef that didn’t bleach. These are our strongest players, these are our super-athletes of the reef. We bring them into the lab, we train them in our environmental treadmills, we make sure they have the best nutrition, and they have offspring that are super corals. And they’re super corals because they can potentially face the future that will be warmer and more acidic -- and survive it. This research is promising, but super corals alone won’t solve this global crisis. Reducing the causes of climate change may be the only way to help corals worldwide make a comeback. You can help at home, no matter where you live. The things that you do to reduce your own carbon footprint will ultimately help corals, so that means maybe shifting to a hybrid car, changing out your lightbulbs to make sure they're more energy efficient, if you're going a short distance, ride your bike, don't drive your car. We should also be thinking about renewable sources of energy -- more solar, more wind -- things that we're already doing, but just ramping those activities up a whole lot more. Why should someone in Wisconsin care? The oxygen they breathe, much of that comes straight off the coral reef. So what we’re looking for are young people to ensure that we have coral reefs in the future. To ensure that we never get to a space where the only place we have a coral reef is in an aquarium. If we can collectively get together to stop what is so easy to stop: the pollution of the coastal waters where coral reefs live. Stop boaters anchoring their boats on the coral reef. Sustain and stabilize the reef we have today, starting now... coral reefs will make a comeback. We just have to do it quickly.